Growth rate: Very slow. It can be expected to grow an average of 6" a year. Mature Size: 30-50' high and 10' wide. Flowers: Pale yellow to white, fragrant, clustered in spectacular, large, long, drooping plumes. Fruit: Round, 3/4" diameter, green, turning to yellow and then reddish-brown. They are tough and edible but very untasty. The seeds are edible after roasting. Leaves: Blue-gray to blue-green, wide, fan-shaped. The fronds remain attractive for several years. 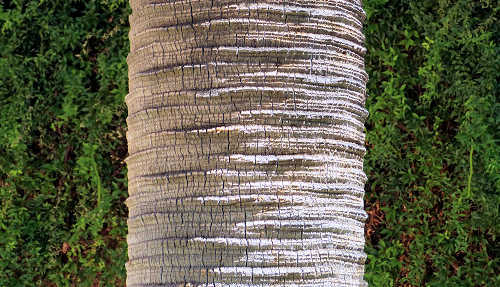 They can be removed from the trunk entirely when they die, resulting in an attractive, ringed, bare trunk. Stems: The leaf stems have thorns. The trunk grows to a 2' diameter. Toxic / Danger: Thorns on leaf stems. USDA hardiness zones: 8b-11. Hardy to 15°F. Sun: Full sun to part shade. Full sun intensifies the blue color in the leaves. Water after becoming established: Every two months during a drought. Water deeply once a month in the hottest months. Soil: Well drained, dry, low organic content, pH 6.6-8.5 (neutral to alkaline). First Year Care: Young plants are not drought hardy and need water weekly. Stake to avoid wind movement. Fertilize: In very alkaline soils, a magnesium deficiency is possible. Prune: Cut off dead fronds when they have folded down to the trunk, making it easier to remove the base of the frond and leave a bare trunk. Litter: Moderate: flower, fruit, fronds. Propagation: Seed, pre-soaked for 24 hours in fresh water. Germination time is erratic and can take months. This plant is a member of the Palm family (Arecaceae). 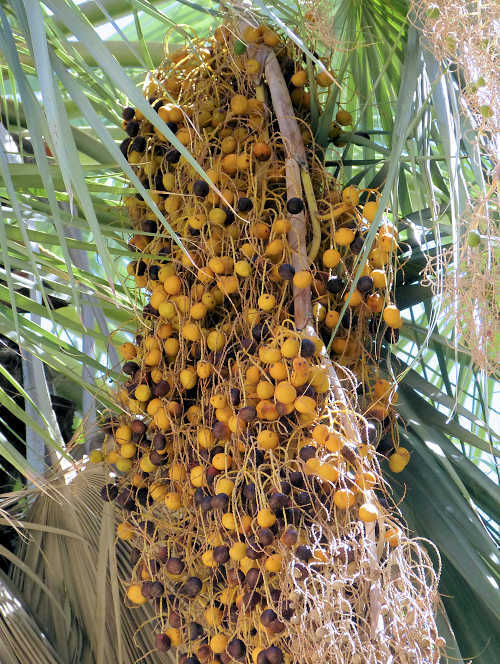 Other common names are Mexican Blue Fan Palm and Blue Hesper Palm. It withstands windy locations. 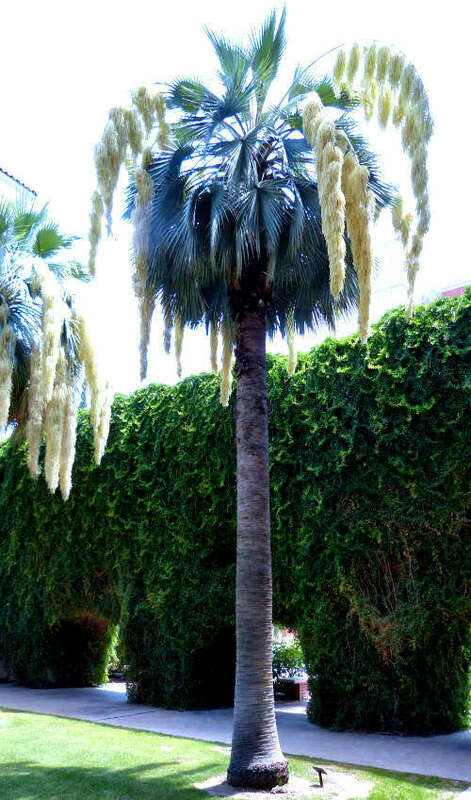 This is not the same plant as the Mexican Fan Palm (Washingtonia robusta) which grows 100' high.